Yep, that's the name they went with. I think I'd be happier with the pun if it wasn't such a common mis spelling. 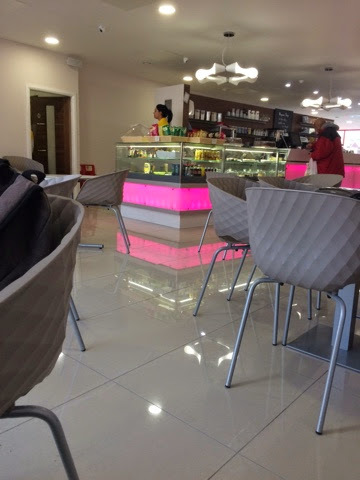 Anyway - this is a new puddings cafe in our local Harborne high street and we thought we'd give it a try. We were surprised by the interior - very well done up considering it was a very run down shop before. It's all super modern and makes pretty good use of a very odd shaped unit - windows on both sides and seats all down the one wall. Pink neon lighting and comfy chairs adds to the ambiance and the nice big tables mean that it'd be fine to hang out here for a while. Indeed there were lots of young families doing just that. 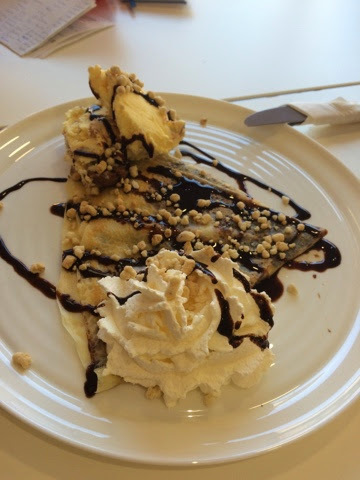 The food was also a delight - there were lots of different options to add on the crepes and waffles and there were suitably fun flavours of gelato to try. We went for the following. 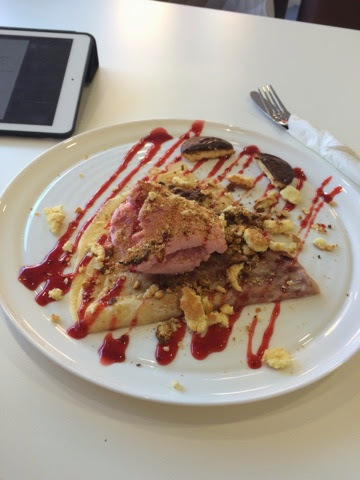 I had crepe with strawberry gelato, raspberry sauce and Jaffa cake. All nicely presented and decent sized amounts too. The gelato was suitably fruity, if not a bit cold for the early Jan weather. I could have piled it high if I were making it but I was full enough afterwards to have to ask for a bag to takeaway the extras I ordered below. My partner had a banana biscotti gelato with chocolate sauce and some kind of biscuity sprinkle. She also asked for no whipped cream so I took that off and put it onto mine. I think they have so many options the smart tills can't cope. Nothing wrong with a pen and a notepad! The tea was £2.10 and £2.60 with a cookie so I ordered the decaf and added a raspberry white choc cookie. I thought it was a bit much for a teabag and hot water, but then this arrived. It's loose leaf decaf tea! Amazing stuff and you got almost three cups worth. With the cookie this was a result. 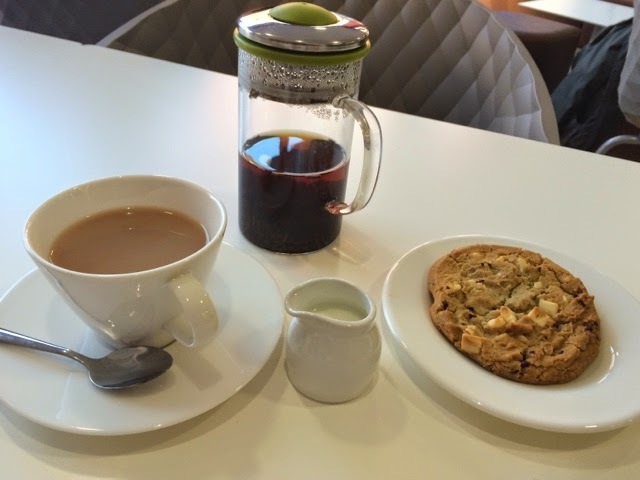 Good flavour and real leaves was a surprise, most places focus on the coffee not the tea. As mentioned the main lunch was so good I saved the cookie for the next day, as expected this was good too. I also picked up a take away goodie for another review too, as they had some odd snacks I've not seen around. All in all a nice new place and worth a trip if you find yourself nearby. And if you don't live anywhere near then I'm sure you also have a local independent desert style cafe that has cropped up so go visit and see what they do!